Cumulus Networks has written a number of demos to showcase Cumulus VX. One of these demos configures a large layer 2 MLAG environment. You can use this demo as is to explore MLAG networking with a Linux-based system. Then feel free to use it as a starting point to create your own virtual network environment that is specific to you own situation. These demos can be downloaded from the CumulusNetworks/cumulus-vx-vagrant GitHub repository. The MLAG demo is in the vagrant/demos/mlag directory. It uses Vagrant with VirtualBox to create a large layer 2 network of 8 switches and 10 hosts. For simplicity, the whole configuration is contained in the single Vagrantfile. No other provisioning tools, such as Ansible, Puppet, or Chef, are used. The file properties.yml defines the number of hosts per rack (default is 5) the number of racks per pod (default is 2) and the number of pods per data center (default is 1). 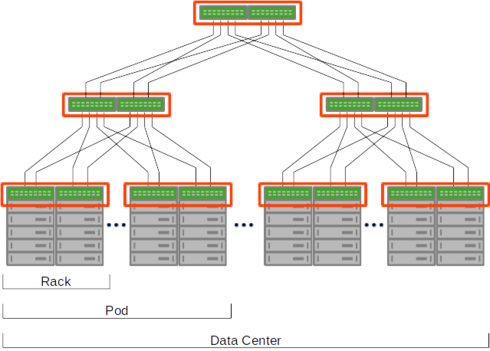 That creates a total of 18 virtual machines; 8 switches (4 ToR, 2 pod, and 2 data center) and 10 hosts. Note that this is different from the number of hosts and switches shown in the figure above. The switches, of course, run Cumulus VX and the hosts run Ubuntu Precise Pangolin (12.04). You can change the size of the "deployment" by changing the values in the properties.yml file. But beware, changing the values in this file can cause a HUGE number of VMs to be created. The Vagrantfile defines the properties of the virtual machines, such as the number of network interfaces, the amount of memory, as well as the connections, or "networks" in VirtualBox terminology, between the virtual machines. The Vagrantfile also provisions each virtual machine, loading whatever configuration is necessary. For the switches, this means creating an /etc/network/interfaces file and loading it. For the hosts, the bonding driver must be installed, loaded, and then the /etc/network/interfaces file is loaded. pNs1 and pNs2 for the two pod switches at the top of each pod, where: N is the pod number, starting from 1. For example, p1s1 or p1s2. pNrMs1 and pNrMs2 for the two top of rack switches, where N is the pod number, starting from 1, and M is the rack number, starting from 1. For example, p1r1s1, p1r1s2, p1r2s1, or p1r2s2. pNrMhH for the hosts, where N is the pod number, starting from 1, and M is the rack number, starting from 1, and H is the host number, starting from, you guessed it, 1. For example, p1r1h1, p1r1h5, p1r2h2, or p1r2h4. After using the demo, try modifying it to include other features or to more closely match your environment. For example, you could place the L2/L3 boundary at the pod switches by using VRR and OSPF.